As Leila began working on her spring collection, she came to the Vans team looking for a more mature, simplistic vibe. As Leila began working on her spring collection, she came to the Vans team looking for a more mature, simplistic vibe. 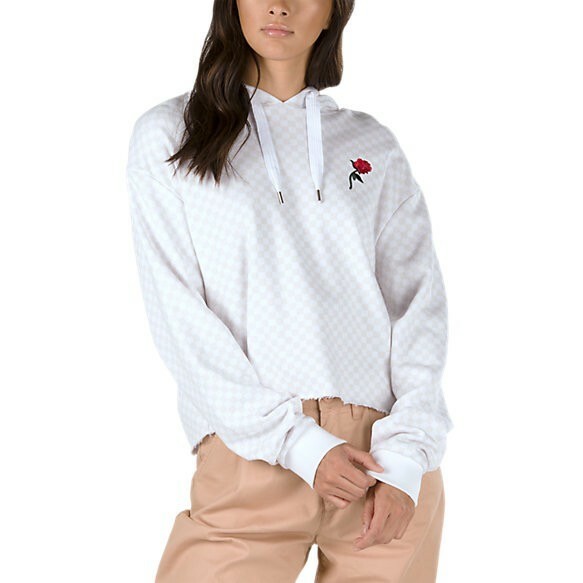 Inspired by floral rose designs and tonal backgrounds with a white checkerboard print, the Leila Hurst Check Pullover Hoodie is an 84% cotton, 16% polyester French terry pullover hooded sweatshirt with a raw cut hem, oversized drawcords, embroidery at the chest, and a cropped fit.